Peter wrote this effective platform game in about one week without the use of specialist game development software. We enjoy the donkey's adventures and trust that you will too. The following screen shot shows the game in action. The width of the window is 500, so you should deduce how to control the donkey. If the donkey falls without a platform to land on, the game ends. 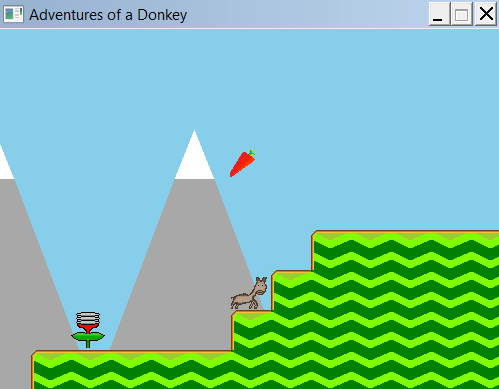 You might expect standard image files such as .bmp files to be used for the donkey, carrots, background mountains and the terrain for the donkey to negotiate. However, Peter stores some of the image data in text files and uses the PutPixel, Bar and FillPoly procedures to render the graphics. The text files spring.txt, carrot.txt, donkey_left.txt, donkey_right.txt are included with the source file adventures.txt in a compressed file, adventures.zip. Download adventures.zip. In order to run program Adventures, you will need to have downloaded also Stefan Berinde`s wingraph.zip file as described in our Graphics tutorial. You should copy the unzipped wincrt.pas, wingraph.pas and winmouse.pas (from the src folder) into your program folder. (The compiled units are included in the zip file but you might as well have the source code available for reference). You should find these three files useful for your own motion graphics programs.